Visite 4 cervecerías artesanales y pruebe 8 cervezas durante esta visita a pie por las cervecerías locales de Buenos Aires. Acompañe a su guía local amante de la cerveza a través del histórico y pintoresco barrio de San Telmo, para descubrir una colección de microcervecerías locales. 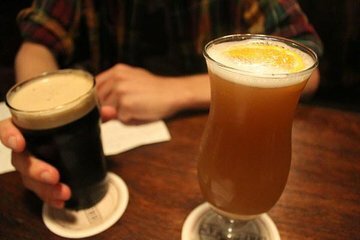 Conozca cómo la economía local influyó en el crecimiento de los productores locales, cómo la cerveza se usa a veces como herramienta política y cómo la cerveza argentina influyó en las cervezas de todo el mundo. Deguste los aperitivos favoritos tradicionales sobre la marcha. Todas las degustaciones y aperitivos están incluidos. What a fantastic way to immerse yourself into the nightlife of San Telmo! Kevin, an ex-pat from California, was the perfect host. We worked our way through a range of beers depending upon taste and preference, visiting a few fantastic bars. As a journalist, chef and foodie, it was a really enjoyable way to spend time sharing a few beers and stories. Kevin was kind enough to recommend a place to eat after our tour and walked us there personally. Awesome night! The selection from the guide tasted terrible and declined to continue the tour. The guide was a six year resident of Buenos Aires from Phoenix, Arizona. He met us on time and showed us three different bars. We were the only two on the tour, so we had his undivided attention. He was very knowledgeable and we enjoyed him a lot. We sampled 7 different craft beers apiece. Not all the same beers. Both Krista and I really liked 6 out of the 7. The only downside to the tour was in the first bar we were eaten up by mesquitos and all three bars lacked air conditioning. Kevin was awesome! It was wonderful meeting someone who came from our country who so obviously loves Buenos Aires and had a lot of suggestions and helpful information for first-time visitors. If you like beer this is a good event - we went to 3 very different bier houses and taverns, had food and beer and good conversation. They also do some other events that we would like to have signed up for if we had more time. Leo was a great tour guide leading us thru San Telmo. The bars/pubs he took us too were unique and had a lot of character to them. You get a good amount of beer samples at each stop and some food was also provided.